Complex IT systems requires careful planning when designing the architecture: How many employees will be accessing the IT resources at any one time? Will the systems be able to meet the requirements of a growing company? Where could there be bottlenecks in terms of bandwidth and computing speed? enaio® allows administrators to easily satisfy the given requirements: The reliable segregation of the database, domain, and application layer provides for the constant optimization of resources that are truly needed. This is done using the IT and administrative tools included within the scope of delivery. The three-tier architecture forms the basis of the core functions of enaio®. It enables the highest levels of performance with simultaneous flexibility. With enaio® you get a whole range of tools for optimal administration and maintenance of your ECM system. enaio® is almost infinitely scalable: All servers use a common database and file system. enaio® is the data hub in your company. Standard interfaces to specialized applications and external systems are available. enaio® is built on a three-tier architecture. The data layer is represented by the database system, the document filing system, and the document archive. All client applications are part of the presentation layer where data is processed. The enaio® server provides the business logic for all enaio® applications, thus serving as the link between the data and presentation layers. Designed as an application, enterprise content management (ECM), and archive server, the enaio® server is set up as a Windows system service. Different server engines (e.g., archive, DMS, Workflows, or OCR) form the basic framework of the application server. They can execute a wide variety of server jobs (search requests from client programs or other servers) which serve to represent the full range of functionality provided by enaio®. The enaio® server provides the basic functions of the overall system for managing, storing, and archiving objects which are output or requested by the clients or integration interfaces. These include, among others, archiving, document management, workflow management, records management, and Web content management. The integrated digital archive manages the process of archiving all documents on write-once media. Any hierarchical storage management (HMS) system can be integrated. The index data is also archived to ensure it can be recovered if the database is damaged. Comprehensive logging provides the basis for audit-proof archiving, with the history allowing you to see which users made which changes to the documents. The documents and index data are automatically versioned based on the configuration and individually recovered if necessary. The workflow management system integrated into enaio® facilitates comprehensive, roll-based business process management (BPM). External specialist applications can be launched via the workflow, and data can be exchanged with these applications. 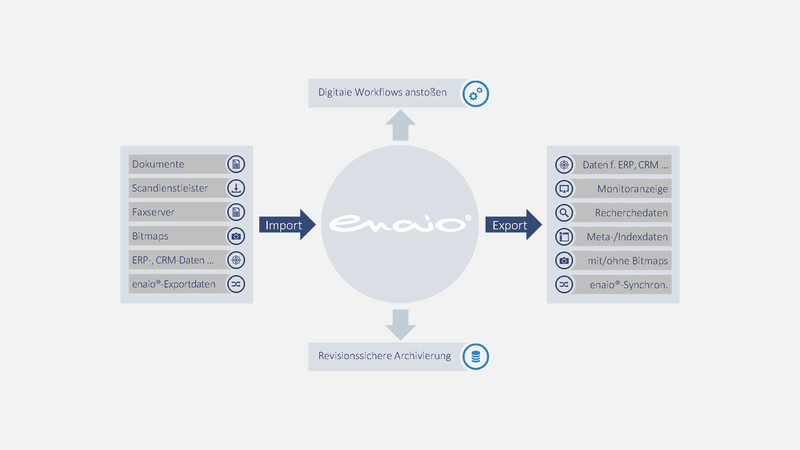 The process-based workflow system from enaio® can also be deployed as a standalone solution independent from the other features of the software suite – also without the enaio® filing structure. enaio® offers a wide range of tools that allow you to manage, monitor, design, and model your enaio® solution. This includes tools to manage the entire system, design the data and workflow model, monitor processes, set up and assign user rights, carry out template administration, and much more. enaio® features a highly comprehensive event logging function, with a distinction made between server- and client-side logging. There are a total of six logging levels. As the administrator, you are able to define where to store the log files. 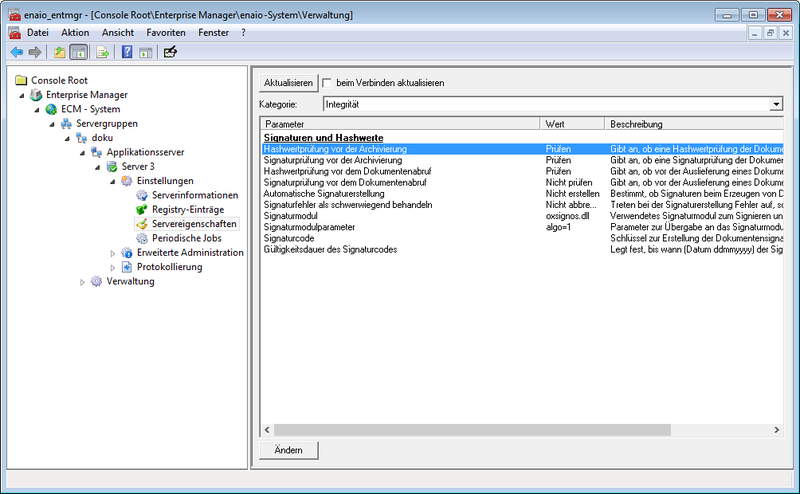 You can allow the relevant registered user to temporarily change the settings for client-side logging for his or her enaio® client instance. Logging events, error reports, and workflow messages enable you to more clearly understand the specifics of a situation, which aids your work as a system administrator. Errors can be identified more quickly, and troubleshooting can be performed in a more systematic way. A user-friendly viewer is available to support you in analyzing log files. You operate a standard system with enaio® using a single enaio® server. If the system is installed in distributed environments encompassing multiple sites, you can add further enaio® servers at the satellite locations. This has a direct positive effect on the performance of the overall system. A satellite server locally stores all documents captured at the respective location where it is installed. At the same time, this server functions as the cache server for documents from other servers of the enaio® system which it does not provide itself. Conversely, other possible satellite servers, as well as the main station, are the cache servers for documents that were stored by the initially described satellite server. The index for all objects from across the entire system is allocated via the main station’s central database. A simple enaio® system consists of an enaio® server and a small number of enaio® clients. If the number of active client applications continues to grow, you can provide further enaio® servers in order to more effectively distribute the load. enaio® is practically unlimited in terms of scalability. All servers access a shared database and file system. 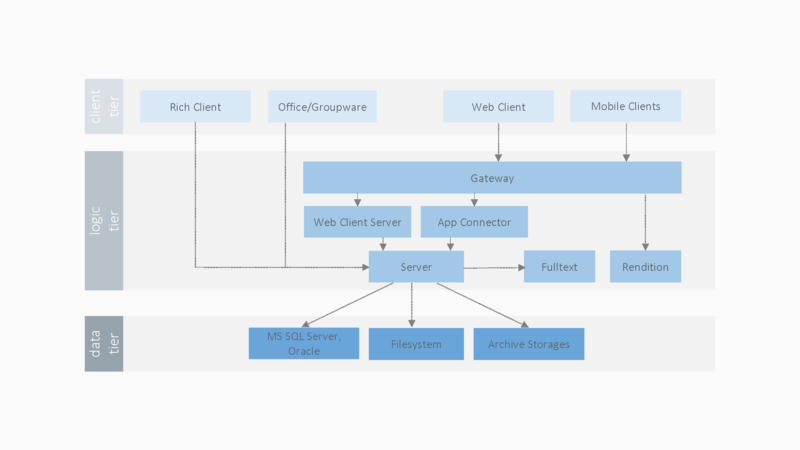 In a load balanced system like this, a client application always logs in on a server that is currently available. The server instances are interchangeable, meaning that each server provides every client application with the same data and access rights. Being interchangeable allows you to ensure that, in such scenarios, there is not one single main server whose satellite servers are served by it. Instead, server groups containing multiple servers, each with the same rights, are created. These make use of a shared database, shared configurations, and a standard directory of registered users. The group servers are managed using enaio® enterprise manager. The goal is to make optimum use of available capacity and to not block shared resources. Changes are made to the configuration to define under which conditions client applications contact the nearest server. Another sample application involves the use of virtual servers. 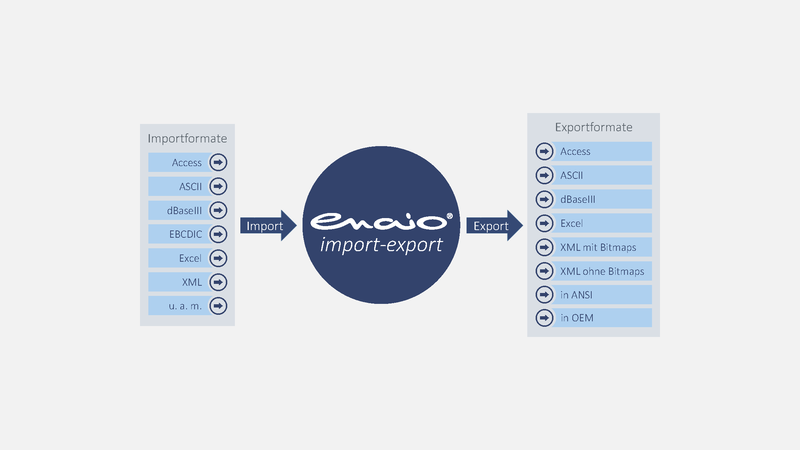 enaio® allows you to manage internal system documents as well as objects found in other digital archives or standalone enaio® systems, among others, via import of index data and references. To this end, you can integrate special modules, i.e., virtual ECM servers, that manage the transfer of documents to and from the external systems. enaio® is the data hub for all types of information at your company. For integration purposes, there are a number of standard and specific certified interfaces to many specialist applications and external systems. These are complemented by special connectors and converters. Server-server interfacing, the connection of external integration platforms, and access to external databases with data fusion and conversion are key elements in the process of merging the company’s existing IT systems to create a high-performance, shared information platform with enaio®. enaio® is a platform with exceptional interface capabilities. Specialist applications, ERP, financial accounting, and CRM systems, medical subsystems and medical information systems, as well as scanners, printers, and storage systems can be connected, independent of the characteristics of the existing IT environments. The required ECM features are made available via high-performance interfaces in the external applications – and vice versa. 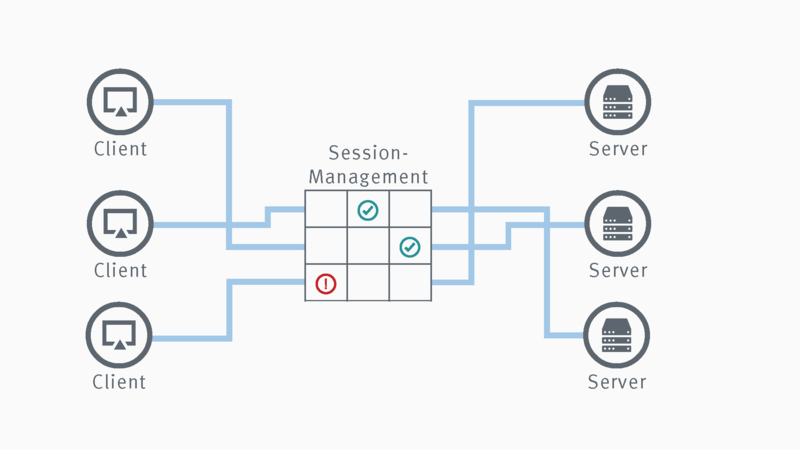 The entire enaio® business logic for the integration of service-oriented architecture (SOA) scenarios is made available via Web services. The top features offered by enaio® archiving components include audit-proof, evidential archiving, authenticity of documentation, and guaranteed compliance with retention periods. Audit-proof archiving is available throughout the entire process, including data backup, organization, and control mechanisms. enaio® stores data and documents in their entirely, organizes them, ensures they are accurate and traceable, compares them with the original in terms of appearance and content, and does so in a way that they cannot be altered or edited. The enaio® electronic archive offers a password-protected system environment, secure database access made possible via an encapsulated archive server, and the use of read-only storage media. Incoming documents are additionally visually compared against the original file to ensure they match. Comprehensive logging ensures that the entire life cycle of a document can be recorded and tracked from the time the file is created, indexed, and saved. This allows for unique traceability, protection against loss or forgery, and reproduction on a computer screen. The enaio® archive offers maximum security and can be seamlessly integrated into leading systems such as ERP, or into specialist processes. Along with that, certified interfaces can be used to connect any storage component. This enables inactive data to be transferred to a secondary storage environment which in turn reduces the workload of the primary systems. enaio® also allows documents and records to be archived in an audit-proof manner. Verification of process compliance as well as the qualified electronic signature with provider accreditation allow an electronic document to achieve legal status as an official document. It is not possible to copy the signature from one document onto another, nor can the document be changed without this being noticed. The German Principles for the data access and the testability of digital documents apply to the archiving of tax-related data. enaio® is able to meet the requirements set out in these principles as well. For example, it is possible to store data for at least ten years, provide online access for external data audits, archive original electronic documents, use read-only storage media, and centrally manage all information in a structured manner with ease. enaio® provides considerable support for IT compliance with audit-proof electronic archiving. The enaio® archive covers other aspects of IT compliance as well. For example, it provides detailed specifications regarding the responsibili­ties of individual employees, traceability of processes, compliance with defined quality standards, data security, and access protection. Full and complete correspondence pertaining to business transactions can be produced on request. enaio® also archives e-mails and any attached files unaltered at the desired locations within the filing structure. This makes it possible to achieve greater transparency and higher productivity and process quality. For us, the key selling points of OPTIMAL SYSTEMS were the modularity and free configurability of its software, as well as the flexible options to integrate our IBM servers. Our overall experience after five years has been extremely good. Even our less IT-savvy employees have had no problems working with the system. Only limited training is required. Users learn by doing. The system runs smoothly and requires relative little time and effort to manage.